In Gansu province of Northwest China, the Po River separates a remote and humble village, Maosi into two parts. 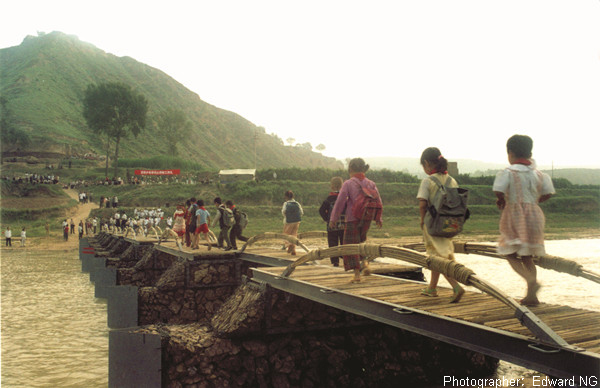 Given the limited types of local construction materials, local people resorted to a primitive and unstable foot-bridge made simply of mud, straw and tree branches over the waters. This was the only crossing for village children to go between school and home. Wading across the river was their daily ritual. Slipping, falling, bruises and cuts were not uncommon. During every rainy season, the bridge would be washed away. The school children could not but suspend classes, stand at the riverside and watch the flooding waters resignedly. In view of this, Professor Edward Ng initiated a joint-university bridge building project entitled "A Bridge Too Far, A Dream Comes True". Gathering the synergy of professionals and students from various universities in Hong Kong and the Mainland, Professor Edward Ng and over 60 volunteers from both Hong Kong and the Mainland erected a permanent bridge with their bare hands in 7 days. The project is developed in such a way that all the parts have very low costs and can be transported and assembled with a minimum of mechanical devices, operated by volunteers without the need for professional training.